Beautify your eyes with skyn ICELAND Hydro Cool Firming Eye Gels (8 pairs). 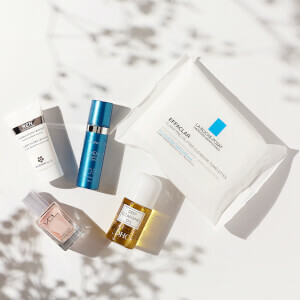 Cooling under-eye gel patches help firm, tone and de-puff delicate under-eye skin within 10 minutes. Peptides and botanicals improve blood flow and reduce puffiness, while advanced antioxidants help prevent future damage. The patch, a cutting-edge delivery system, is easy to both apply and remove and is non-irritating. Ideal for those who want to firm, tone and reduce the appearance of puffiness, fine lines and wrinkles around the eye area. Remove backing and apply gel side to under eye-area for 10 minutes. After treatment, gently peel away patch and follow with Icelandic Relief Eye Cream. Use once a week or whenever you need a quick fix. OMG. These are so nice when stored in the fridge!!! They work & feel better than without!! You can feel instant hydration and reduction of puffiness with this eye mask. my second time purchase this stuff,fast absorbing if the price should be more lovely, that is will be absolutely perfect. It's great to use for me and easy to absorb it. Suggest to you. Love this eye masks! Great for traveling and days you wake up feeling dehydrating and tired. After you remove them, the under eye area is smooth and hydrated. Try these before you apply your makeup for a night out or the next day after the night out ;) Make sure to pack these in your travel bag too. After a long flight, they are a life safer, waking up your eyes and bringing back the hydration to your skin after being cooped up in a plane. I do not think it is "cooling", but it definitely helps when puffiness is concerned. Most people deal with under-eye-darkness and I with puffiness, which is due to medical imbalance/problems! I have been testing out anything for under-eye stress, from low-end to high-end and we all know there is no magic wand for fix this issue! However, Skyn ICELAND's Hydro Cool Firming Cooling Eye Patches are one of the best remedies out there that actually work just like a caffeine jolt to the face, they are a must-have for me! No matter how tired I am, a quick application of the cooling gels manages to calm and refresh my skin, achieving the effect of an instant eye lift in minutes! They de puff and even reduce the dark circles for those who are looking for under-eyes-dark-circles! I followed them by the cooling eye cream and you are good to go! Because of the advance antioxidant, I strongly believe by using these Cooling Eye Gels regularly ( I use them 3 times a week ) they will literally help the appearance of the eye area and help prevent future damage as well! I really hope my review of the Skyn Iceland Hydro Cool Firming Eye Gels would help you with your purchase of this product!